A1 Lincolnshire northbound severe disruption, between A52 Grantham North and B1174 Great North Road. A1 Lincolnshire - One lane closed and queuing traffic on A1 northbound between Grantham North and Marston Turn Off, because of an overturned Burger Van. Jerome Sinclair scores twice as Oxford see off Scunthorpe and earn a vital win in their bid to beat the drop from League One. John Akinde's brace cements Lincoln City's grip at the top of League Two as the Imps defeat Forest Green at The New Lawn. Cambridge boosted their League Two survival hopes with victory at mid-table Grimsby. 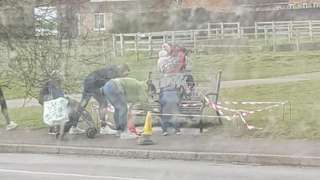 The names "Shell" and "Jane" were scrawled into wet cement under the bench in Horncastle. Victims were forced to work for little or no pay, laying driveways for the family business. A Lincolnshire family who kept slaves benefited to the sum of almost £4m, Nottingham Crown Court heard today. 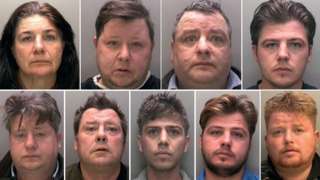 Twelve members of the Rooney family were jailed for a total of over 90 years for their roles in what was called the biggest slavery ring in British legal history. Over £1m was confiscated by the courts today and the Rooneys face further jail time if they fail to pay within three months. The majority of the confiscated funds will be paid to their surviving victims, in terms of compensation and ‘wages in lieu’. Police looking into the disappearance of a man from Lincolnshire nearly 20 years ago, say they've tried everything to find him, including drones. Glyn Taylor (pictured) disappeared in broad daylight on a road near Spalding in 2001. As technology has developed, police have started using new techniques to find out what happened. But Detective Superintendent Jon McAdam, who's involved in the operation, says police have "no idea what happened to him or where he is" but say they review the case on a yearly basis. But despite two decades passing, Glyn's childhood friend has set up a Facebook page, desperate to find anyone who may have seen him all those years ago. We wish we knew where he was. If he's listening, just get in touch with us, you're not in trouble. We want to know. We just want to give you a hug and say everything's going to be fine. Lincoln's biggest private employer says it's investing millions of pounds into its research and development facility in the city. Tech firm Siemens, which makes gas turbines in the city, says the £6.5m investment will also see some employees move from its factory site on the outskirts of Lincoln to its city centre site. The firm has been based in the city since the 1970s and is based on the site where aircraft and tanks were made during World Wars One and Two. The Met Office has issued weather warnings for Lincolnshire this weekend. It says Storm Freya will bring "very strong winds" this Sunday, and potentially cause travel disruption and possibly dangerous conditions for drivers on Monday morning. More children are getting their first choice of secondary school in Lincolnshire this year compared with in 2018. 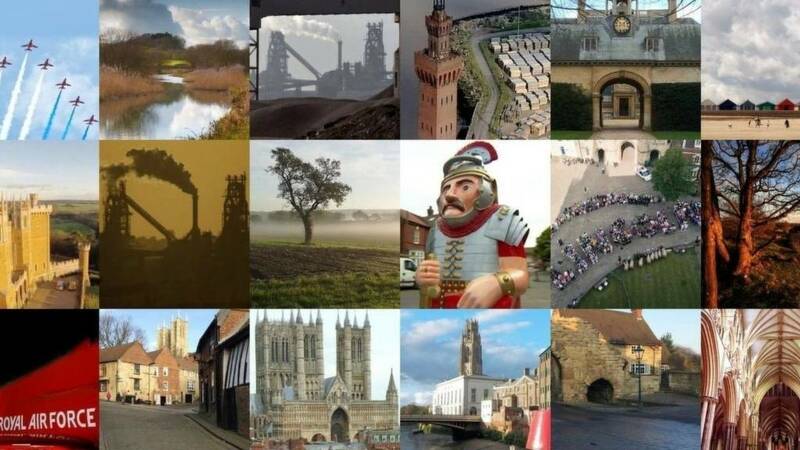 A total of 88.6% of students will get their first choice of school place in Lincolnshire this September. That's a small increase on last year's figure of 87.8%, equating to 250 more students this year getting their first choice out of a total of 8296. A homeless man who served in the Army in Afghanistan is staging a protest to request a flat from Lincoln City Council. Tom Foley, who was in the Army for five years, has pitched a tent outside City Hall to appeal for a home. He says he's "gone down every avenue" and registered with "every charity" to try and find a suitable place to live. Lincoln City Council says it's offered him a bedsit, but he's refused it because he says it's too small to accommodate his four children. If I'm out of sight, it's out of mind with these. I just hope that here they'll see what I'm actually going through. I believe it's their job to get me somewhere, so here I am, and I'm not moving until they do." Parts of Lincoln cathedral will be in the dark overnight, while new floodlights are fitted. The current floodlights were installed in 1977, and new environmentally friendly LED ones will replace them. Over the nine months the new ones are being fitted parts of the cathedral will be without lighting temporarily. The new lights will no longer cast an orange glow on the cathedral though, they'll be a softer white light. Students in Lincoln are playing truant today to protest against what they say is inaction against climate change. The students from Lincoln Christ's Hospital School say they're protesting because they feel "not enough is being done about climate change". It comes after students internationally have staged protests for the same reason. The government says: "While it's important for young people to engage with issues like climate change, the disruption to planned lesson time was damaging for pupils." A man in Gainsborough has been arrested on suspicion of producing class B drugs. Police say they raided a property on Lea Road in Gainsborough and seized cannabis plants, cash and phones. The 26-year-old man has been released under investigation. A Lincolnshire police officer has been forced to justify having a coffee break while on duty. Sgt Mike Templeman was having a hot drink with some colleagues when a member of the public asked whether it was the best use of taxpayers' money. One of the reasons I encourage all my staff to go out and have their breaks out if they can is because we're visible. People are always saying the police aren't visible. So we try to be, and we can respond quicker to jobs." A fairly dull start with plenty of cloud today along with some mist pockets of drizzle. Video caption: A fairly dull start with plenty of cloud today along with some mist pockets of drizzle.A fairly dull start with plenty of cloud today along with some mist pockets of drizzle. A giant replica of the moon is to be installed at a museum in Lincoln. The work, pictured above at St Giles Cathedral in Edinburgh earlier this year, is by artist Luke Jerram and appeared at Hull Minster last year as part of the Freedom Festival. The 23ft (7m) diameter orb, covered in detailed NASA imagery of the Earth's surface, is 1.8 million times smaller than the real thing. It'll be shown at the The Collection museum in Lincoln until the end of April.